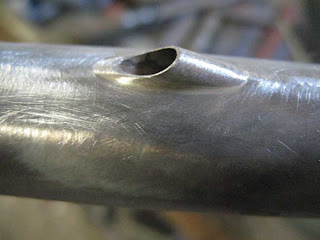 Jet vent is framebuilder slang for internal routing. In this case it’s the rear brake that’s internally routed through the top tube. 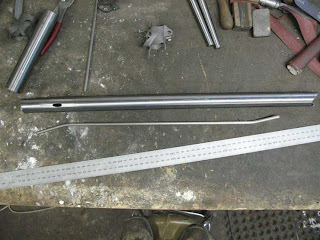 The first picture shows the mitered top tube and the stainless steel tube that will be brazed in. You can see it’s bent on each end and on the top tube one of the openings for the stainless tube is visible. The bends are so the tube passes through the middle of the top tube. 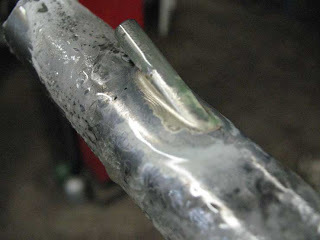 This prevents the tube from hitting the top tube and making an annoying metallic “clink” sound whenever the bike runs over a bump. 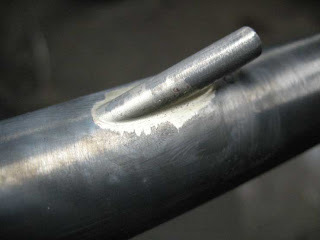 Here’s a picture of the stainless tube inserted in but not brazed. The third picture is of the tube brazed in with the flux still there. I took this picture right after turning off the torch. I braze one end and then let it cool before brazing the other end. This reduces any possible issues with jet venting thin top tubes. The fourth photo shows the same thing as the third but after the flux is soaked off. 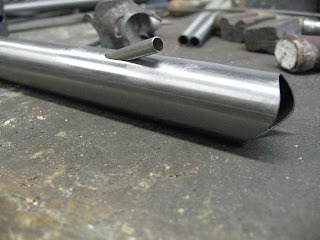 The last photo is after the end of the tube has been shaped and the excess silver has been sanded off. The shaping is done with a Dyn afile which is a hand held pnuematic belt sander. It makes quick work of it and yields great results.